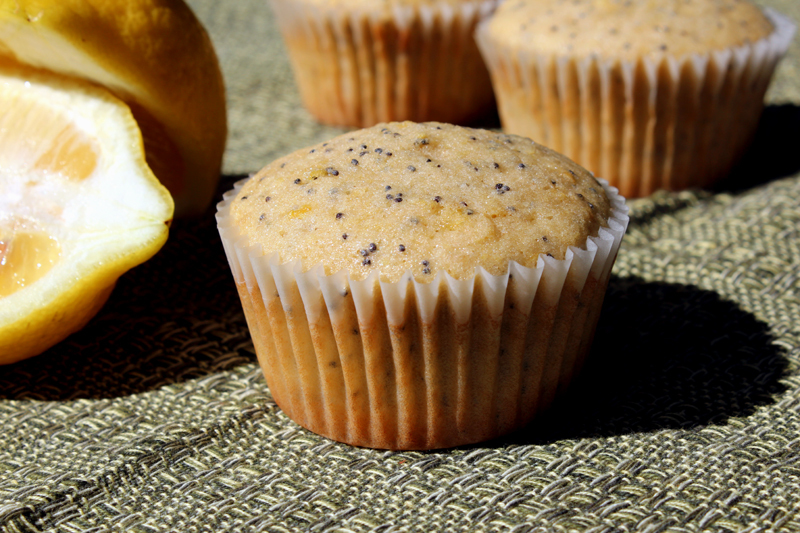 Happiness Project Recipe #11: Saturday Morning Lemon-Poppy Seed Muffins! Considering how up & down I’ve been with the pain this week, I was damn near frothing at the mouth this morning for something super moist & fluffy. Something that didn’t involve any chocolate for once. I know, I know, who AM I, right?? *wink* So this super moist & fluffy “something” ended up incorporating my 2nd all time favorite dessert flavor: lemon. Luscious, luscious lemon! Whenever I think of weekends, the idea of muffins always seem to come to mind, so with this being said, I decided to tinker with a recipe I’ve never done before: Lemon-Poppy Seed! Though I will forever be a cupcake girl, the muffin is the 2nd closest thing to it, so why (oh, why) have I never made any before?! Fortunately, my Williams-Sonoma Baking Book saved the day (or morning, to be precise). A little bit of soft butter spread also created that extra burst of flavor to a rather good Saturday baking adventure as well. For all of my lemon loving friends (I know who you are! ), here’s the recipe..
Preheat your oven to 350F. Butter 10 standard size muffin cups or line 12 cupcake tins with paper liners. Gather up your ingredients & necessary baking equipment. You’ll need 3 separate medium size mixing bowls for this recipe. In your 1st mixing bowl, on a stand mixer, cream together the butter and sugar on medium speed until light and fluffy. While this is creaming together, separate your 2 eggs. I use two small bowls to keep the egg yolks separate from the egg whites. Add the yellow egg yolks, one at a time, beating well after each addition until well blended. In your 2nd mixing bowl, stir together the flour, baking powder, baking soda, grated lemon zest & salt. Quick tip: After you gather your ingredients, zest your 2 lemons with a stainless steel grating zester (which you can find at any local Bed, Bath & Beyond, Williams Sonoma or Sur La Table store) BEFORE you begin the process of mixing together your ingredients. Preparation is key to creating a quicker, easier & cleaner (yes, cleaner!) baking experience. Now, using the mixer on low speed, add the flour mixture to the butter mixture (bowl #1) in 2 additions, alternating with the buttermilk, then the lemon juice and then the vanilla. Beat until just smooth (for approximately 1-2 minutes). For the next step, if you don’t have 2 separate stand mixers (I certainly don’t but wish I did), pour the entire mixture into another medium sized bowl & set aside. At this point, you’ll need to thoroughly wash & dry the bowl that you’ve just emptied (bowl #1). Once clean & completely dry, use this bowl again in your stand mixture, using a balloon whisk to beat your egg whites just until they form a soft white peak (beat on high for 2-3 minutes.) Do NOT over beat your egg whites! Keep in mind that they need to be a soft peak consistency not a stiff one so keep a close eye on them while in the process of whisking. Using a large silicone spatula, gently (no elbow grease required!) fold the egg whites into the batter until just blended. Cool on a wire rack for 5 to10 minutes before serving. And don’t forget to add some of your favorite butter spread to them as well! A properly dressed muffin is always the perfect muffin, I say! There you have it! Quick & easy! So if you too have a napping husband & therefore a little extra time on your hands, prepare yourself (and your kitchen) for the sudden appearance (and resulting disappearance) of these soft, tangy, lemon filled creations! Huzzah for Saturdays! « Happiness Project Recipe #10: White & Dark Chocolate Cake Brownies!